After raising a $680K seed round of funding earlier this year, the London-based, French-founded Festicket announced that they will be partnering with France’s largest e-ticket retailer, Digitick, embedding their white-label festival package solution inside of Digitick site, enabling Digitick to offer exclusive package deals for some of the biggest music concerts in France, such as Rock en Seine, a Paris music festival which rivals Reading Festival, Bonaroo, Lollapalooza & Coachella in size & artists. “We are very excited to be working with Digitick, as France has a huge, festival-hungry market which we’re keen to tap into. 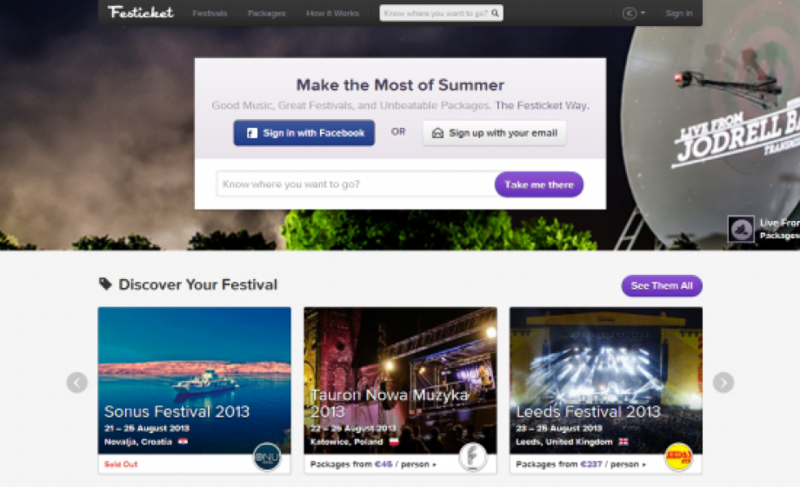 The country also has some fantastic music festivals and we will be adding packages to the best ones on Festicket.com, giving our customers even more choice,” – Zack Sabban, co-founder and CEO of Festicket. Digitick’s online presence has posed a large threat to the formerly dominant FNAC, who’s retail chain has been suffering the same Amazon-induced fate as many other consumer electronics & book retail stores around the world. Partnering with Digitick represents a big move for Festicket, who, while certainly closing any opportunities to work with FNAC, is investing in the high-growth e-ticket market in France, opting for the 2nd largest player over the large incumbent. That last sentence is not coherent with the article title. Are Digitick the biggest or the 2nd-largest? I believe they are #1 online, #2 overall. FNAC has a huge ticketing business in their retail stores.